Classical busts and sculptures are a nod to homeowner Mike’s childhood partially spent in Greece. New York–based designer David Frazier gave his parents’ house a dramatic refresh—just in time to host his 10-year high school reunion. For Georgia-based Buffy Ferguson and New York–based David Frazier, two designers were better than one when it came to freshening up David’s family home. His parents, Patsy and Mike Frazier, purchased the house in 2005 but began to grow tired of the ’90s-era, cookie-cutter decorating. 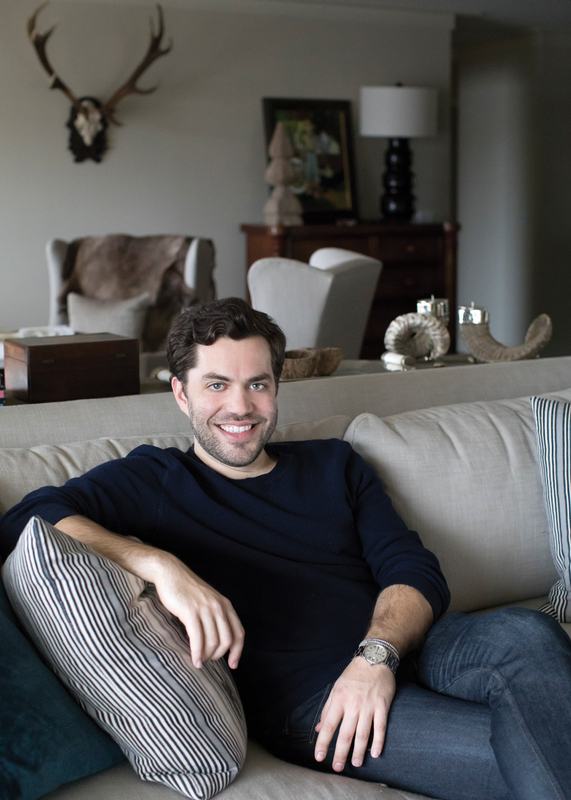 David, who graduated from Auburn University with a degree in architecture, had since moved to Manhattan and launched his own design firm, so he called in Buffy to collaborate and execute the job. Her office in West Point, Georgia, is just across the state line from the Fraziers’ home in Lanett, Alabama. But Buffy, a family friend, was more than the local liaison. She helped bridge design styles between a 20-something and his parents and take the pressure off mixing work and family. “Buffy played ‘middle man’ between Mom, Dad, and me,” David says. “She also has a much more feminine sensibility and could soften my modern aesthetic.” The design team was taking their time until David agreed to host his 10-year high school reunion and a friend’s engagement party there. “There’s nothing like a hard deadline to create some urgency to finish,” he says. “I wanted this to feel like a private dining room in any great New York City restaurant, but the kind of space you can use as a game room, a work space—and it’s been used for all that,” says David. 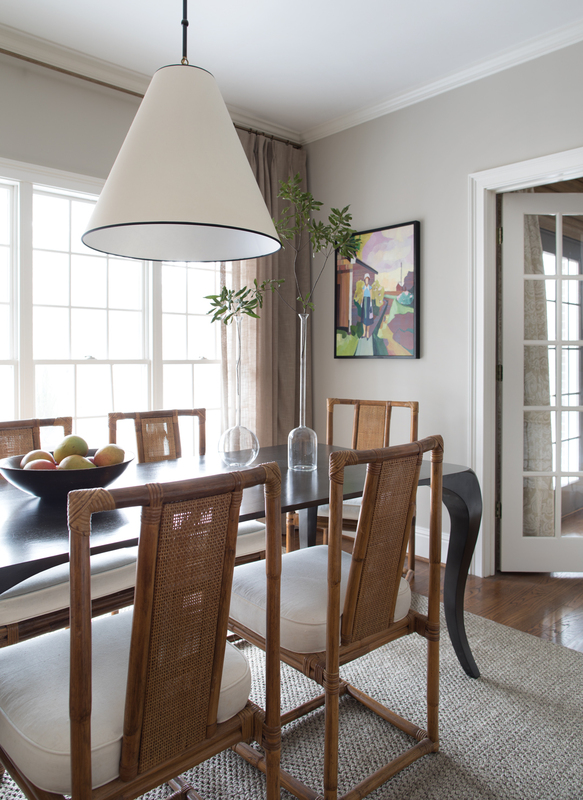 “There’s no reason for a dining room to feel like a banquet hall used once a year.” Moody “Toucan Black” by Benjamin Moore coats the walls; David’s friends at Blackshop created the custom black steel console. The “wow” doesn’t have to come from architecture. “This is a pretty typical suburban house,” says Buffy. “But you don’t have to have a house with great features to make it dramatic.” Dark walls and light furniture—with one eye-catching painting in each room—provide the sophisticated dynamic in both the dining and living rooms. A hornet’s nest found at the family’s second home on Lake Martin serves as a favorite piece of art in the keeping room. An adjustable floor lamp by Visual Comfort illuminates reading chairs by Noir. Art collections can provide unity. 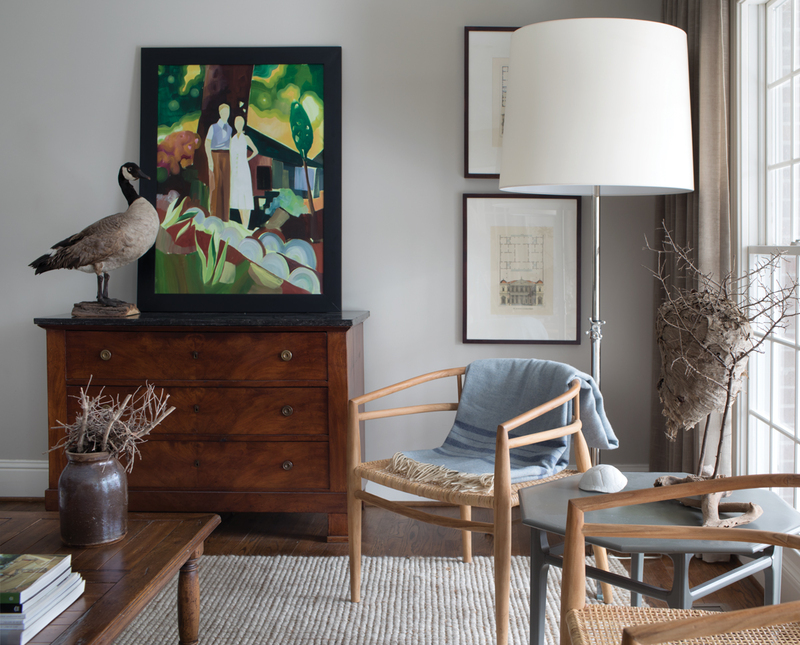 Paintings by Signe and Genna Grushovenko, collected over the years, are in almost every room. “My parents and I joke that we’re their largest gallery,” says David. Buffy points out the appeal of the colorful, layered pieces, with references to vintage photographs: “It’s approachable art, and each one evokes memories, as if you could imagine someone you know in each painting,” she says. Lighter, upholstered furniture is from Bungalow Classic on Atlanta’s Westside. To mask an asymmetrical grouping of windows and doors, David covered them with bamboo shades and new draperies. 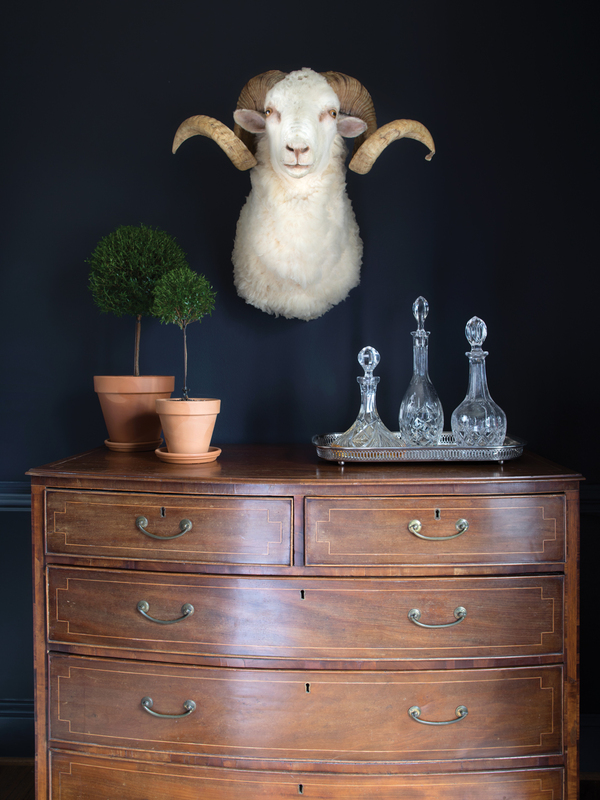 A vignette with dark walls, a mounted ram’s head, and sculpted topiaries epitomizes David’s love of contrast. Furniture with history and the patina of old wood is important, so antiques in each room are as key as comfortable seating. Compromises were part of the process, too. David lobbied for a more modern light fixture in the dining room, but Buffy steered the choice to a brass chandelier with an overscaled edge—more appealing to the parents but still a look everyone could get behind. Dining Room Table: Noir, noirfurniturela.com. Chairs: Restoration Hardware, restorationhardware.com. Console: Blackshop, blackshopbham.com. Foyer Chest: Scott Antique Markets, scottantiquemarket.com. Bench: Noir. Living room Sofa and chairs: Bungalow Classic, bungalowclassic.com. Drapery fabric: Schumacher, fschumacher.com.